The light patterns were hidden within a strip of sky observed by NASA's Spitzer Space Telescope revealed the faint, lumpy glow given off by the very first objects in the universe. 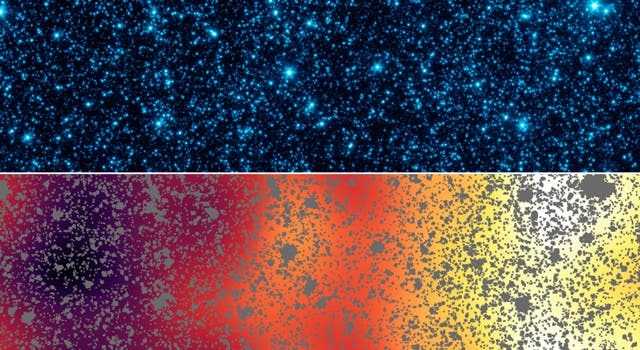 These faint objects might be hugely massive stars or voracious black holes. They are too far away to be seen individually, but Spitzer has captured new, convincing evidence of what appears to be the collective pattern of their infrared light. "These objects would have been tremendously bright," said Alexander "Sasha" Kashlinsky of NASA's Goddard Space Flight Center in Greenbelt, Md., lead author of a new paper appearing in The Astrophysical Journal. "We can't yet directly rule out mysterious sources for this light that could be coming from our nearby universe, but it is now becoming increasingly likely that we are catching a glimpse of an ancient epoch. Spitzer is laying down a roadmap for NASA's upcoming James Webb Telescope, which will tell us exactly what and where these first objects were." Spitzer first caught hints of this remote pattern of light, known as the cosmic infrared background, in 2005, and again with more precision in 2007. Now, Spitzer is in the extended phase of its mission, during which it performs more in-depth studies on specific patches of the sky. Kashlinsky and his colleagues used Spitzer to look at two patches of sky for more than 400 hours each. "We can gather clues from the light of the universe's first fireworks," said Kashlinsky. "This is teaching us that the sources, or the "sparks," are intensely burning their nuclear fuel." The universe formed roughly 13.7 billion years ago in a fiery, explosive Big Bang. With time, it cooled and, by around 500 million years later, the first stars, galaxies and black holes began to take shape. Astronomers say some of that "first light" might have traveled billions of years to reach the Spitzer Space Telescope. The light would have originated at visible or even ultraviolet wavelengths and then, because of the expansion of the universe, stretched out to the longer, infrared wavelengths observed by Spitzer. "This is one of the reasons we are building the James Webb Space Telescope," said Glenn Wahlgren, Spitzer program scientist at NASA Headquarters in Washington. "Spitzer is giving us tantalizing clues, but James Webb will tell us what really lies at the era where stars first ignited."